Old Bronx pics are amazing. The Bronx of 100 years ago was very different but in some ways very similar. Much of the West Bronx was developed, the street grid we’re familiar with today was already pretty much laid out as well as the subways we ride today. At a glance, it looks very similar on the surface but when you head on over to the East Bronx, the differences can be huge. The neighborhoods east of the Bronx River didn’t develop until well into the 20th century (with a few exceptions) when the subway was extended. Up until then, it was mostly farmland and estates. While perusing New York Public Library’s Digital Collection, we came across these old Bronx pics we’d thought you’d like to see and catch a glimpse of our borough long before any of us were around. 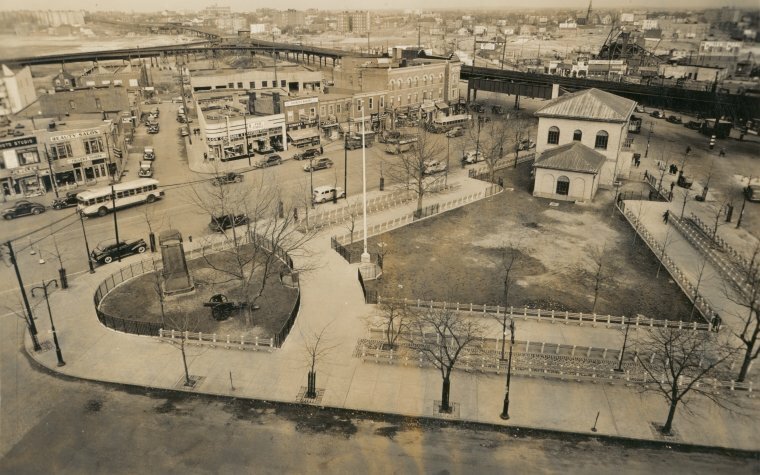 View of Westchester Square and Owen Dolen Park/New York Public Library Archives, The New York Public Library. “Bookmobile – Bronx” The New York Public Library Digital Collections. Pelham Parkway facing East from the subway at White Plains Road. Note how there is not one building up yet./Irma and Paul Milstein Division of United States History, Local History and Genealogy, The New York Public Library. “Bronx: Bronx and Pelham Par – White Plains Road” The New York Public Library Digital Collections. 1914. 711-715 E 231st Street in 1929/Irma and Paul Milstein Division of United States History, Local History and Genealogy, The New York Public Library. 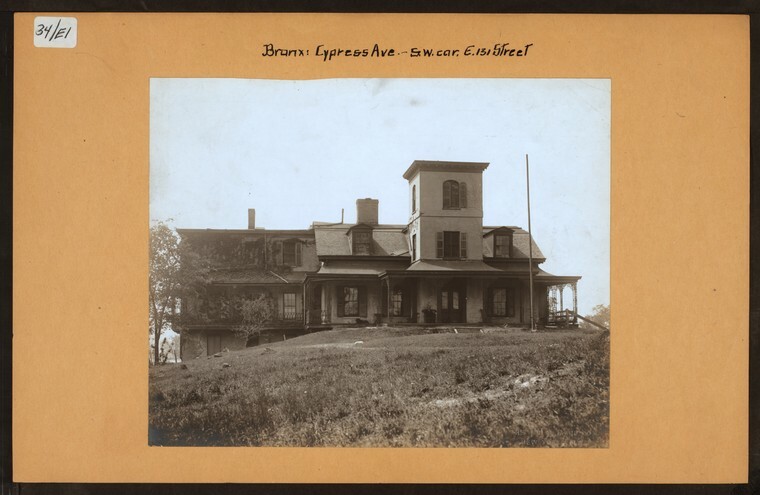 “Bronx: 231st Street (East) – White Plains Road” The New York Public Library Digital Collections. 1929. Allerton Avenue at White Plains Road in 1917…hard to imagine that this was Allerton 100 years ago/Irma and Paul Milstein Division of United States History, Local History and Genealogy, The New York Public Library. 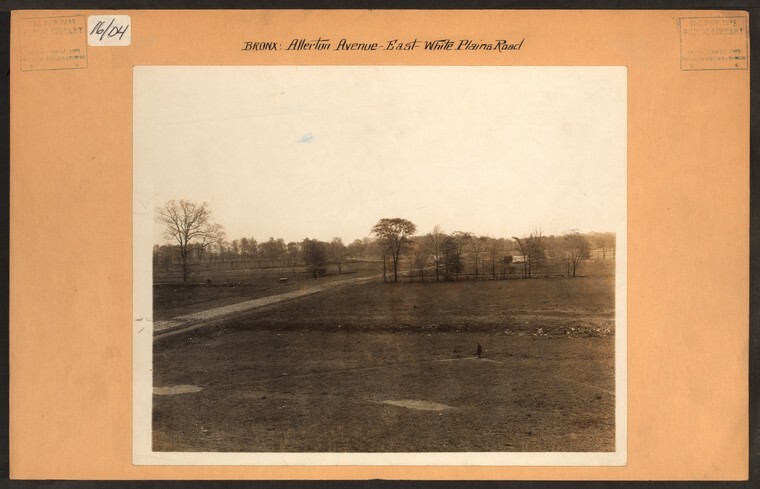 “Bronx: Allerton Avenue – White Plains Road” The New York Public Library Digital Collections. 1917. Arthur Avenue and 186th Street in 1930/Irma and Paul Milstein Division of United States History, Local History and Genealogy, The New York Public Library. “Bronx: Arthur Avenue – 186th Street” The New York Public Library Digital Collections. 1930. 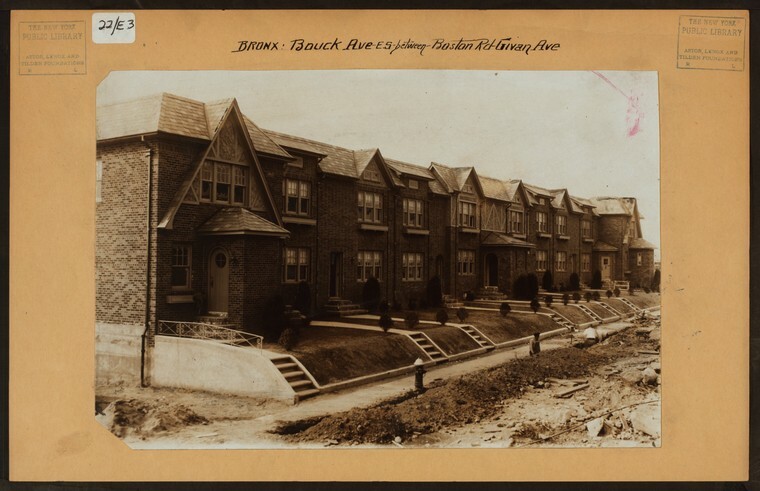 Homes being constructed in 1927 on Brouck Avenue between Boston Road and Givan Street. The houses are still standing/Irma and Paul Milstein Division of United States History, Local History and Genealogy, The New York Public Library. 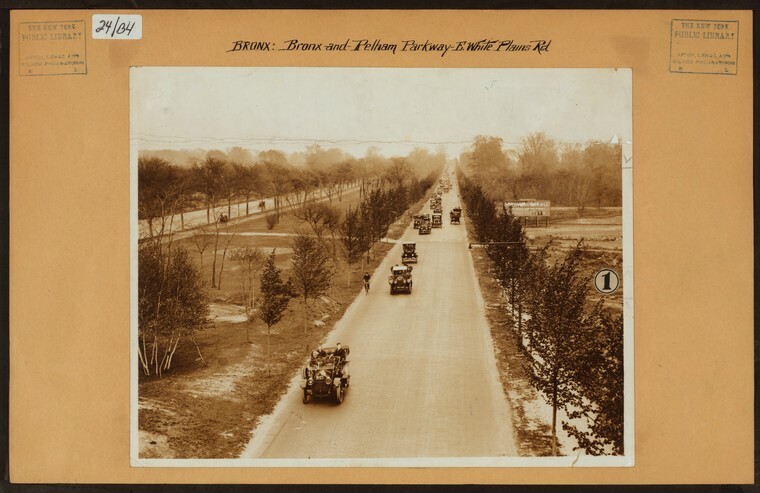 “Bronx: Bouck Avenue – Boston Road” The New York Public Library Digital Collections. 1927. 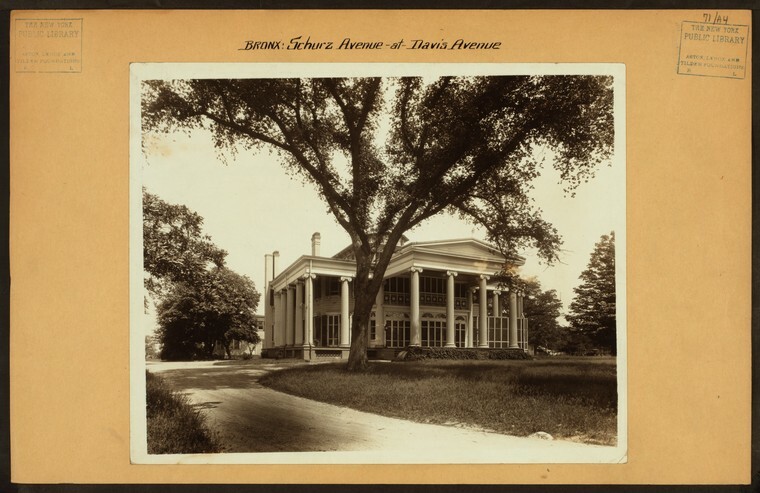 1905 pic of the Gouverneur Morris Mansion on Cypress Avenue and 131st Street which was built in the early 1800s. Alas, it was torn down ages ago. What’s there now? The approach to the TriBoro Bridge (aka The RFK but who calls it that? )/Irma and Paul Milstein Division of United States History, Local History and Genealogy, The New York Public Library. 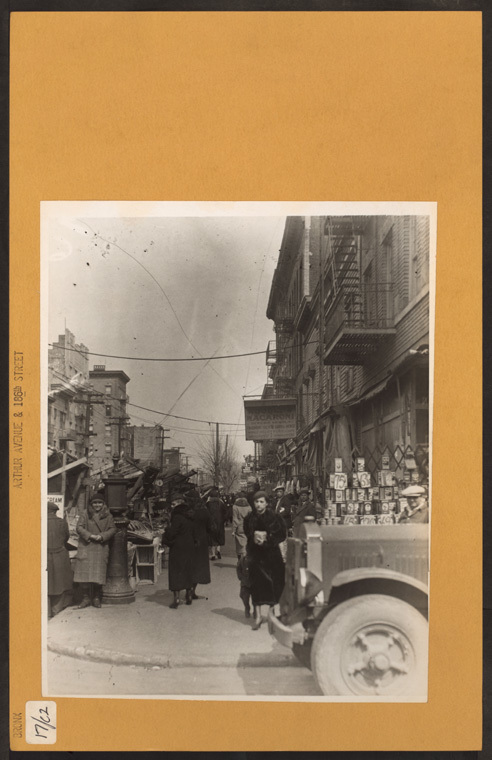 “Bronx: Cypress Avenue – 131st Street (East)” The New York Public Library Digital Collections. 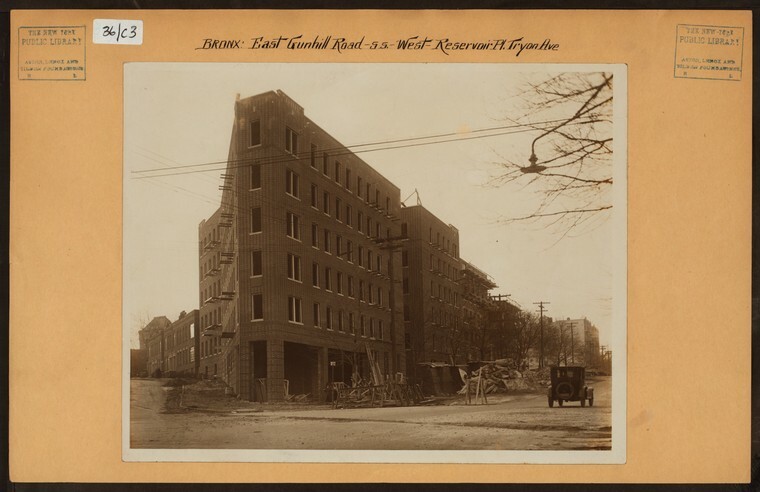 282 E Gun Hill Road (at Reservoir Place) under construction in 1927/Irma and Paul Milstein Division of United States History, Local History and Genealogy, The New York Public Library. 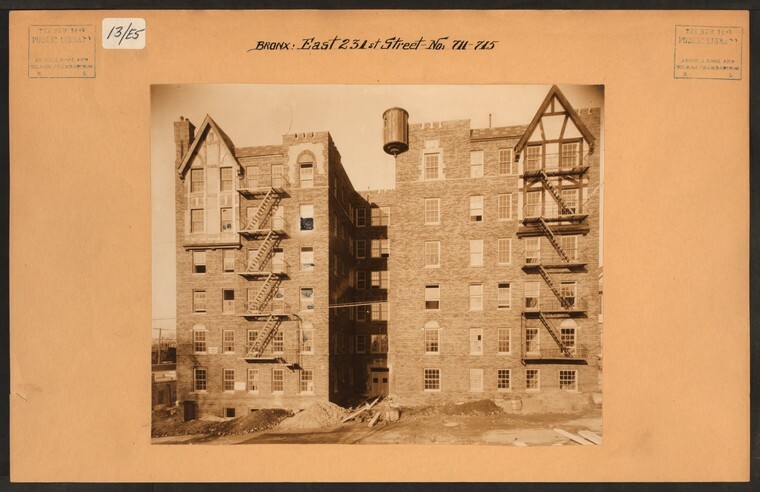 “Bronx: Gun Hill Road (East) – Reservoir Place” The New York Public Library Digital Collections. 1927. “A Palace Home for Millionaire Bankrupts” exclaims an ad in a 1924 newspaper clipping just shortly after the massive mansion on The Grand Concourse was completed. The ad continues, “Suppose you had once been rich. Suppose you had lived in luxury and mingled in exclusive social circles. And suppose you lost every dollar you had. If you had lived in New York or other big city, if you had been banker, judge, or even idle social panderer, you would still be able to live as you had formerly. For Andrew Freedman, multi-millionaire, died and left $4,00,000 for the building and furnishing of a palace on the Grand Concourse, New York City, where those once rich could enjoy the luxuries of life even though broke. The conditions are that you must be 60 or more, be cultured, and be absolutely “broke.” Applicants are put through the most rigorous questionnaire and their stories carefully checked. Out of thousands of applications but thirthy have taken in. The mansion covers an entire city block. Furnishings were collected and placed by most expert interior decorators. Every convenience of a millionaire’s home is there. And it constitutes one of the most astounding heritages ever left.” (United Newspictures, Inc)Irma and Paul Milstein Division of United States History, Local History and Genealogy, The New York Public Library. 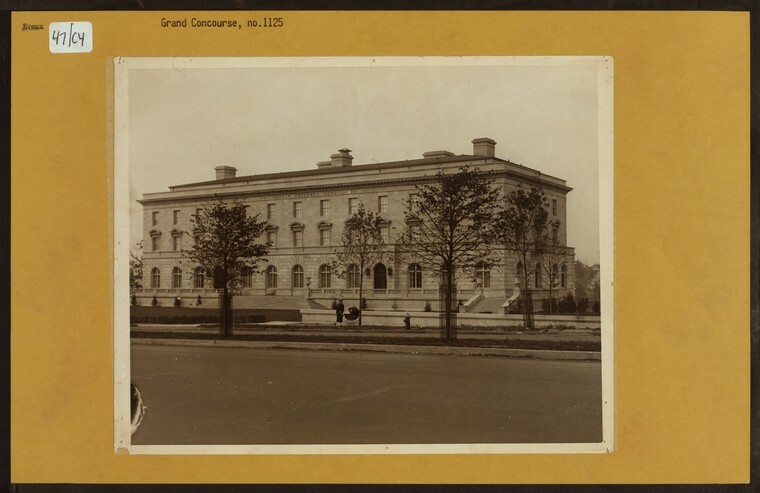 “Bronx: Grand Concourse – 168th Street” The New York Public Library Digital Collections. 1141-1161 Jerome Avenue at 167th Street in 1928/Irma and Paul Milstein Division of United States History, Local History and Genealogy, The New York Public Library. “Bronx: Jerome Avenue – 167th Street (West)” The New York Public Library Digital Collections. 1928. Long before Orchard Beach was created by Robert Moses (by destroying Pelham Bay with landfill to create the beach and parking lot) Bronxites flocked to Pelham Bay Park shoreline to frolic in the summertime sun as seen in this image from 1900/Irma and Paul Milstein Division of United States History, Local History and Genealogy, The New York Public Library. “Bronx: Pelham Bay Park.” The New York Public Library Digital Collections. 1900. The old Franklin Theater on Prospect Avenue and 161st Street/Irma and Paul Milstein Division of United States History, Local History and Genealogy, The New York Public Library. 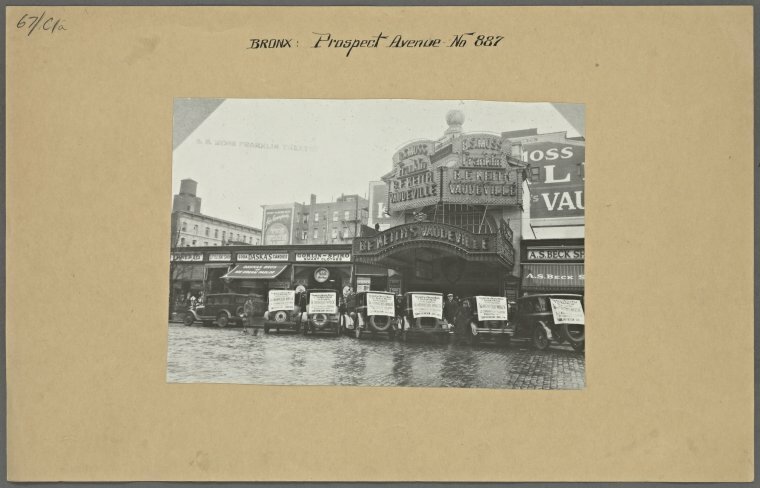 “Bronx: Prospect Avenue – 161st Place (East)” The New York Public Library Digital Collections. And that’s it for now, hope you enjoyed this trip back in time with us. Make sure to follow us on Facebook so you don’t miss stories like this!